We’ve set up the world’s first ‘Looseum’ to pay homage to a great Aussie icon, the backyard dunny. This one-of-a-kind mini-museum in Brisbane features thunderboxes which have been restored to their former glory, as well as funny stories and photos from dunny-lovers across the nation. Last year, Queensland Urban Utilities launched a search for Australia’s last remaining backyard dunnies, in a bid to capture this important history before it disappeared. Our search uncovered more than 120 dunnies still standing proudly in backyards across Australia. Some dunnies had been transformed into garden sheds and chicken coops, and there was even the rare dunny still in use – sawdust and all! We’ve chosen the best stories and photos to feature in our ‘Looseum’, which provides a quirky but important reminder of how far the sewerage network has come since the 1900s. Before many areas were sewered, a trip to the loo meant braving the elements and warding off creepy crawlies to visit the backyard dunny. Night soil men used horse-drawn carts – and later, trucks – to collect and empty the waste bucket from each household’s dunny. It was a very different system to what we have now! These days sewerage is a hidden service that we don’t tend to think about, but a lot goes on behind the scenes. 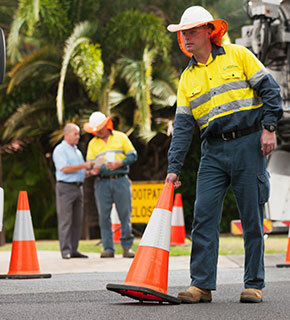 In fact, more than 1.4 million people rely on Queensland Urban Utilities' sewerage network, which includes more than 9000km of sewer pipes, 332 pump stations and 29 sewage treatment plants. View the online gallery to see all the submissions we received during our Great Backyard Dunny Search. The ‘Looseum’ is located at the Innovation Centre at our Luggage Point Sewage Treatment Plant, which is an active work site. We’ve set up this online gallery so you can visit the ‘Looseum’ from the comfort of your own home! Click to enlarge each image and read the caption. To read the ‘Looseum’ signs, click on the thumbnails below to view a high-resolution version of the artwork. Each image will open in a new tab.